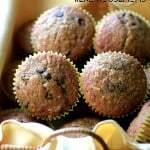 A tender, delicious sunny banana, chocolate, coconut muffin that can brighten your day. Line a muffin tin with 18 liners. Preheat oven to 375F. Whisk together the flour, baking powder, baking soda and salt and set aside. In a bowl of a standup mixer add the brown sugar and butter. Mix well. Add the eggs and vanilla, mix well. Add the dry ingredients. Add the apple sauce and banana. Mix until the banana is broken up but still leaving tiny chunks. Carefully stir in the chocolate chips and coconut. With a small measuring up or large spoon add the muffin batter to the cupcake liners filling them about 2/3 to 3/4 full. Bake for 20-22min. or until golden brown and spring back easily with a light touch.